Preacher: Larry W. Dean (4), Jeff Pollard (3). Series: Featured (2), Convocations (3), Convocation2016 (1), Revival (1). Service: Sunday Morning (4), Evening Message (3). Revelation 3:14-22 (Part of the Featured series). Preached by Larry W. Dean on June 3, 2018 (Sunday Morning). Preached by Larry W. Dean on April 15, 2018 (Sunday Morning). Revelation 3:14-22 (Part of the Convocations series). Preached by Jeff Pollard on February 22, 2018 (Evening Message). Revelation 2:1-11 (Part of the Convocations series). Preached by Jeff Pollard on February 21, 2018 (Evening Message). Revelation 1:1-7 (Part of the Convocations series). Preached by Jeff Pollard on February 20, 2018 (Evening Message). Revelation 2:1-3:22 (Part of the Convocation2016 series). Preached by Larry W. Dean on February 21, 2016 (Sunday Morning). Revelation 2:1-7 (Part of the Revival series). 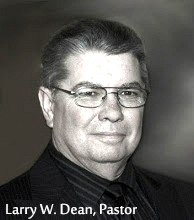 Preached by Larry W. Dean on November 19, 2011 (Sunday Morning).